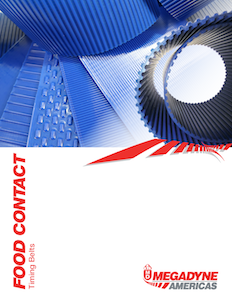 Blue Megalinear and Megapower FC (food contact) belts are made with a urethane compound designed for use in food processing and sterile conveying applications such as packaging. Megalinear, made with a Kevlar™ reinforcement is available with a smooth convey side or in a variety of convey side impressions to assist in product handing. Megapower FC, a molded endless timing belt reinforced with stainless steel cords is designed for use both power transmission environments as well as conveying. The urethane chemistry used to produce these belts makes them ideal for use in oily and humid environment's where belt washdown is common. Learn more about our Megapower and Megalinear FC Timing Belts.